As the patron of WALDA, it was fabulous to see the enthusiasm for our inaugural design awards held in October. It gave me great pleasure to award the very first Patron’s award for the most outstanding student entry to Kevin Schaffer. The Gold Award went to Daniel Ridley, Silver to Bonnie Stacey and the Bronze also to Kevin Schaffer. For me, Kevin’s entry was a standout in terms of artistic presentation, but looking beyond that, I also saw a great deal of creative potential. His design was responsive to the brief and the brief itself illustrated the narrative of the site from the designer’s perspective, without compromising the ultimate function of the space. 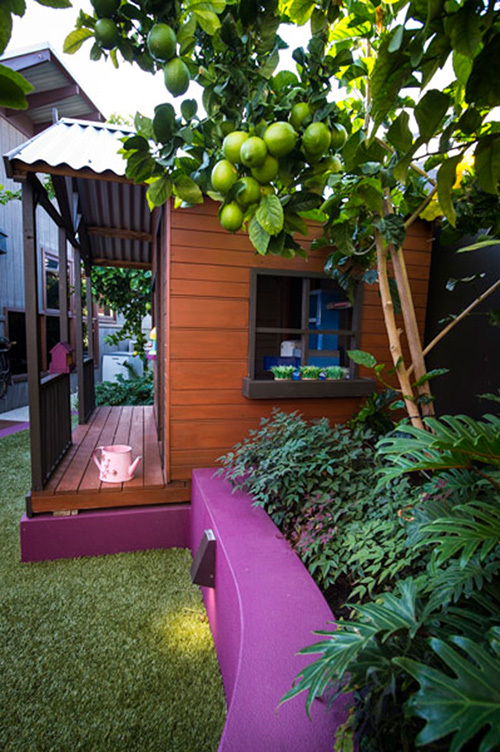 The awards aimed to recognise and showcase the very best landscape design projects in WA and even though I am the patron, it was decided that I should enter these first awards too. I was thrilled to achieve an award for all three categories I entered into. We had some very demanding, yet professional judges in Greg Grabasch from UDLA, Eije Morizumi from Japanese Landscapes and Matthew Lunn who is also a well respected landscape designer and media identity. 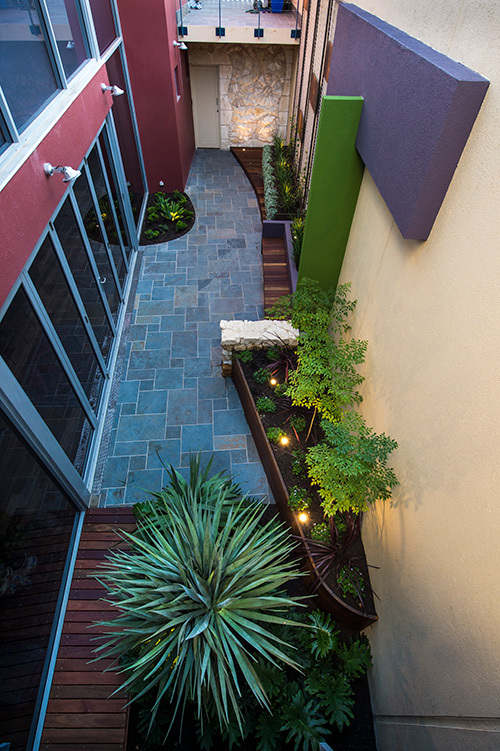 For this long narrow Fremantle courtyard, there were numerous design challenges including the high surrounding walls, the lack of planting opportunities and the fact that the existing stone paving was not to be disturbed. Kings Park Entry Courtyard: This compact entry courtyard is adjacent to Kings Park. It doubles as the main entertaining area and the entry from the adjacent garage. The design creates a sense of journey from the gate to the glass living room doors. 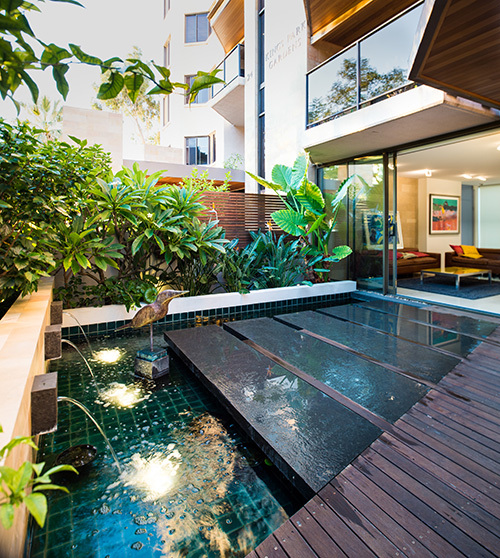 The style is Australian contemporary sub tropical. Mount Hawthorn Courtyards: This design is a series of three courtyards for a federation style home in Mount Hawthorn. The home has a traditional facade but transforms itself into a contemporary home with a very modern extension to the rear of the property. The swimming pool sits in the front courtyard, the central courtyard is the transitional space from traditional to contemporary and the rear entertaining courtyard is also for children’s play. 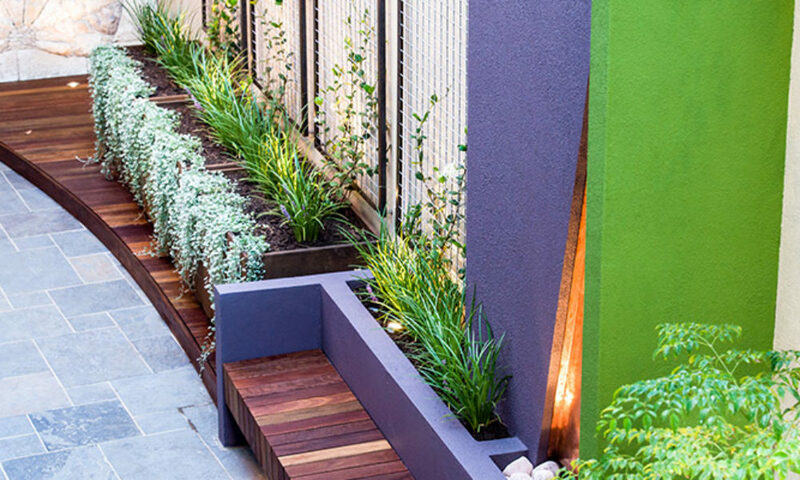 The West Australian Landscape Designers Association’s awards will be biennial and is open to full members of the Association. If you are a designer or a student, I encourage you to join our fledgling association so you can not only enter the next awards, but enjoy the many benefits such as networking and social events, professional development days and reduced prices for special events.